Sudoku Game is written using C# in the Source Editor. The general ideas, while Sudoku Game writing, were its style and simplicity for using. Sudoku Game works (with some differences) under the .NET Framework (version 2.0 ...). Change behavior and appearance of any game part from its localizable context menu. Change all its text (or translate into other language) by simple editing two plain text files. Print out solved by inner solver game. 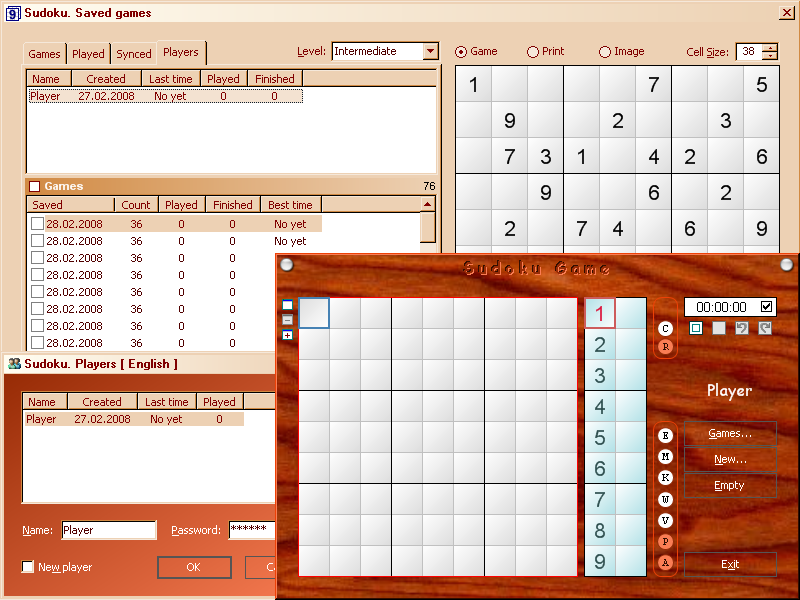 Classic Sudoku game with 3 layouts, colorfull, customizable and localizable. * Pause the game for a while and resume it later, or save it not finished to fill it next time. * Change its appearance for all layouts or separately for each one by assigning its background. * Print out selected or generated games (from 1 to N games per one sheet) or save game as image. * Change all its text (or translate into other language) by simple editing two plain text files. * Change behavior and appearance of any game part from its localizable context menu. * Import received from somewhere its inner lists (games, patterns...). * Download additional backs, games, and patterns. * Run program from removable (flash,...) disk. * Look at the 'pairs' in the solved games. * Print out solved by inner solver game. Amazing, challenging, intriguing, and entertaining puzzle game. Qweas is providing links to Sudoku Game 1.1.4.4 as a courtesy, and makes no representations regarding Sudoku Game or any other applications or any information related thereto. Any questions, complaints or claims regarding this application Sudoku Game 1.1.4.4 must be directed to the appropriate software vendor. You may click the publisher link of Sudoku Game on the top of this page to get more details about the vendor.